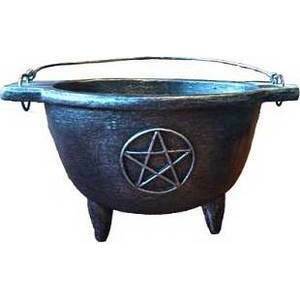 This is a wonderful pewter tone decorative cauldron, which is a powerful symbol of magical rebirth and the forces of creation, adorned on both sides with a raised pentagram, which is a symbol representing the five elements encircled or protected by a symbol that represents eternity or infinity. This cauldron may be used to hold magical offerings upon an altar or other treasures that one may wish to store within it. Crafted of cold cast resin and will not rust. This cauldron is NOT heat or fire safe. Cauldron measures 6 inches in diameter and comes with a 4 inch wire handle.